Off-road running is good for the body and the soul. Off-road running is good for the body and the soul. Trails don’t pound the legs, their uneven surfaces and hills build leg and lung strength, and they provide a close-up view of Mother Nature at her best. 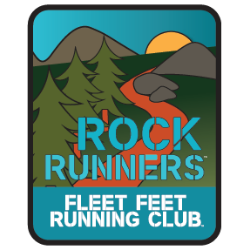 Fleet Feet Running Club offers both a "short" and a "long" Rock Runners trail program. Our 10-week 10k Rock Runners program teaches participants how to safely enjoy off-road running and introduces them to different local trails. Team members should enter the program capable of running at least 3 miles on the roads at a pace of 12:30/mile or faster. Members of our 10-week 13.1M Rock Runners program and should enter the program available to run at least one group workout each week and capable of running at least 5 miles on the roads at a pace of 12:30/mile or faster. Our 10-week summer Rock Runners 10k and 13.1M programs will begin with a kickoff meeting on Monday, May 6th, 6:00pm at our Des Peres store. We train Wednesday evenings and Saturday mornings. If you are an Active-level member of Fleet Feet Running Club (FFRC), we invite you to pass the time before your program begins by joining us for our Thursday evening and Sunday morning social runs. Among other benefits, Active-level FFRC members receive a discount on training programs. To become an Active member, click here. To register for our Summer Rock Runners 10k program, click here. To register for our Summer Rock Runners 13.1M program, click here. Active-level club members receive a 15% discount. Click here to learn more.